Norfolk Nog is a dark, full bodied, red brown beer with plenty of flavour and aroma. Roasted malt complements the sweeter components of the palate. A superb and warming beer with bags of character and flavour. 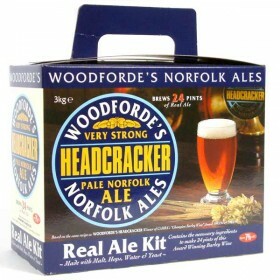 Woodfordes cask conditioned Norfolk Nog won the highest possible acclaim when it was awarded CAMRAs Champion Beer of Britain in 1992/93. It makes 40 pints at an ABV of 4.5%. I like my beer dark and tasty and this was my first attempt at home brew. I added half a bag of sugar it the first stage and 1/4 teaspoon to each bottle at bottling stage. 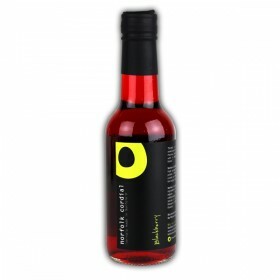 It created a fantastic, full-bodied, and very tasty beer. I think I prefer it to the real thing. Watch out Woodeforde's! Thanks for prompt delivery of my order for Woodfords NOG kit which arrived safely, pity the carriage cost is so high though. 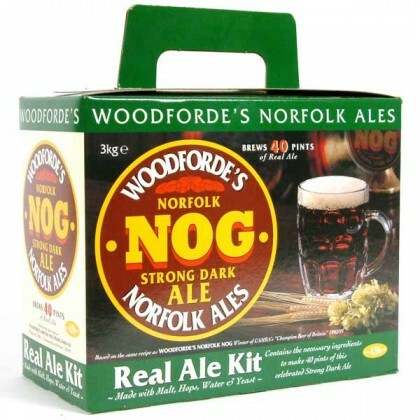 I can thoroughly recommend NOG to anyone wanting to try something satisfying and different. 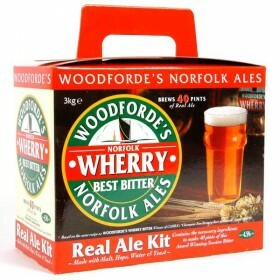 As a home brewer of (cough) years experience, I have made numerous brwes and tried numerous kits. This kit is simply divine! 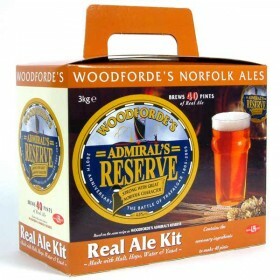 The closest I have found in terms of home brew to the famous Adnams Broadside. Brew it and (most important) leave it to mature in the barrel. The results will be both satisfying and well worth the time and effort. 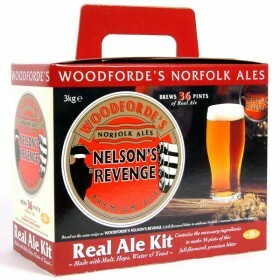 I have been making up homebrew kits for many years now and must have tried most of them but Woodefordes Norfolk Nog is one that I will always come back to - It realy hits the spot, smooth and nutty. This is an excellent kit. This just gets better and better in the barrel, a complex mix of tastes , if you like dark complex brews you will love this. It is better than many beers you will buy in a pub - maybe that's damning it with faint praise! if you like olds or porters this is the one to beat.